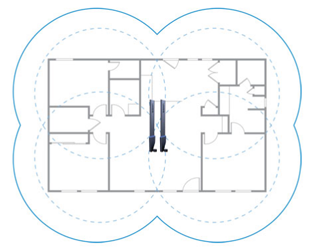 High-Gain Wireless Antennas offer an easy way to expand your wireless network's coverage. These antennas are equipped with our omni-directional broadcast technology, which amplifies the signal strength of your Wi-Fi devices to deliver more wireless range and performance across the horizontal plane. This makes them ideal for large, single-story households that need a strong Wi-Fi signal in every room.